Lee Ufan was born in 1936 in Korea and moved to Japan in 1956. Today, he lives and works in Tokyo and Paris. For the past 30 years, Galerie m Bochum has been following the artistic development of Lee Ufan, who at the latest since his participation in the 7th Paris Biennale and Documenta VI in Kassel in the 1970s has been among the leading figures in contemporary art. In 2001 he was awarded the prestigious Praemium Imperiale for his paintings. The current exhibition of Lee Ufan’s work, titled “Silence,” opened on March 31 with the artist in attendance, and will be on display until June 28, 2006. 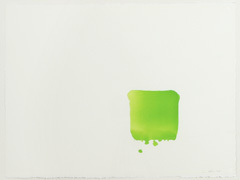 The show gives viewers a comprehensive, cross-genre overview of Lee Ufan’s most recent works. In addition to a wall painting and indoor/outdoor installations, which Lee executed on site, Galerie m is also displaying new works from the artist’s Correspondence series, along with intensely colorful watercolors. The exhibition’s title, “Silence,” is meant to contrast it with our everyday lives, filled as they are with an overload of information and images, while silence and concentration are harder than ever to come by. 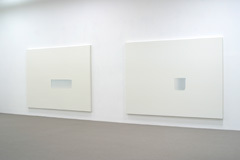 Lee Ufan’s art is marked instead by the minimal artistic intervention, the sensitive reserve of the action not taken. His pictures are painted in contemplative tranquility with tightly focused artistic self-expression. This demands a high degree of discipline, which Lee induces within his painting through the constant repetition of the same rigorous exercises. Individually positioned, broad brushstrokes are a key feature in the Correspondence series. Lee executes these brushstrokes in harmony with his breathing, so that the act of painting becomes a purely physical gesture. The artist’s focused breathing is given pictorial form in the even, flowing line of the brush. On what are sometimes extremely large, unframed white canvases (218 x 291 cm), painting loses its primacy. Lee’s works are to be understood as impulses that effect an opening to the surrounding void – infinity as superior entity. In the wall painting Resonance, which Lee executed on site at the gallery on March 29, 2006, the omission of the canvas allows the work to open itself up even more directly to the space and to the viewer. At the same time, a consciousness of the transience of the manmade world comes more strongly to the fore. Lee’s brushstrokes seem as if they are about to disappear – an effect heightened by their colors and distribution across the surface. 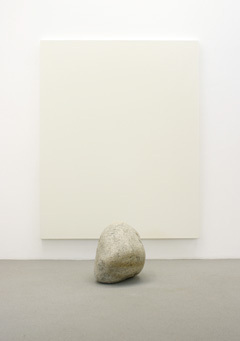 Lee Ufan uses the term “Relatum” to refer to his sculptural works. They usually entail the juxtaposition of steel and stone, two diametrically opposed materials in terms of properties and origins. While the steel plates are industrially manufactured and standardized, in other words, abstracted, the natural stones are untouched and indeterminate. Lee takes these elements out of their original context in order to place them in a specific place and in a direct relationship to one another, to the space and to the viewer. He thus succeeds in creating an extraordinary experiential space, which points beyond what is consciously seen – a space of silence and meditation. The impression of lightness in these installations belies the enormous exertion expended to put the weighty stones and plates together. In their new context, the materials develop a specific kind of tension. While the steel plates convey above all a sense of finely calibrated balance, the stones take on a transcendental quality. In the installation Relatum – go and stop, the dominant impression is that of the liveliness of the stones, which are in part halted in their movements by interposed steel plates. In Relatum – meditation by contrast, the stone seems to repose peacefully, in the shadow of a screen-like steel composition. We recommend that exhibition viewers also pay a visit to the grounds of Haus Weitmar in Bochum, adjacent to the gallery. 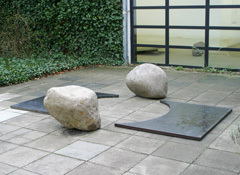 Here can be discovered three sculptures by Lee Ufan, along with works by Ulrich Rückriem, Erich Reusch, Richard Serra and Giuseppe Spagnulo. An information brochure is available free of charge at Galerie m Bochum.